A classic tour report is linked below. 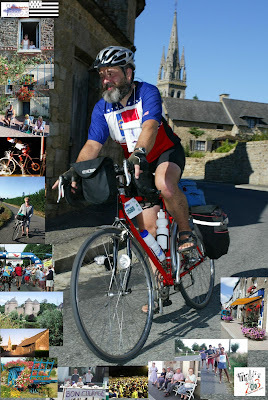 I believe Adrian Hands and I met this fellow in 2006 at the Moulton English bicycle rally. He traveled very light on a Moulton APB 21 with just a saddlebag, bivy tent and sleeping bag and lightened even further on day two by discarding the Tent! Frank Burn's second LEJOG was from the most southern tip of England to the tip top of Scotland. It is called Lands End to John O'Groats; or of late, "LEJOG." 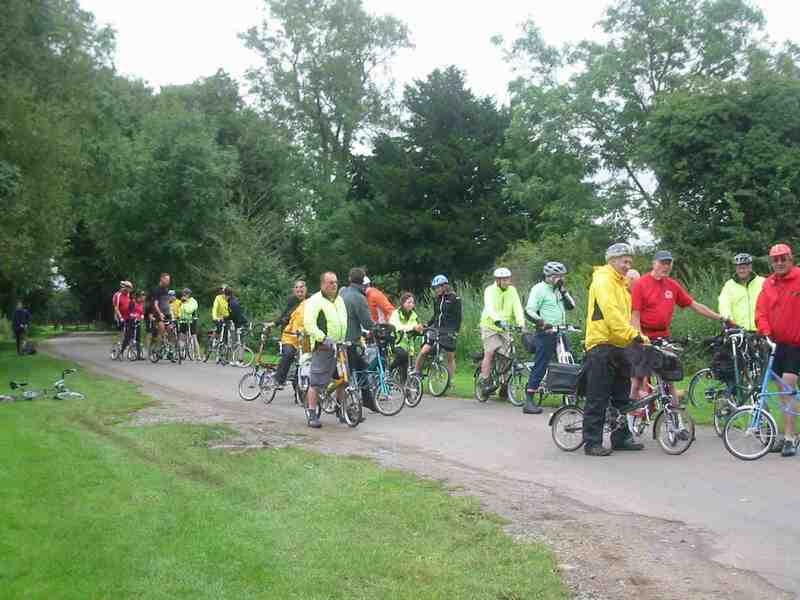 This is a cycling classic and a pilgrimage that is a must do if you love riding in England. For participants in the LEL (London -Edinbourough -London) rando event some of the descriptions and names may be somewhat familiar. This blog has been inactive for one year as of Feb, 3 2012. The fine fellow pictured above was the inspirational force and heavy lifter of this blog and passed away one year ago. Like "Madonna, Cher, Sheldon, Jacko and others some people only need one name for identification and Adrian Hands is well known worldwide in the cycling world as well; just Adrian! The North Road website and blog were his creation but most of the posts, blogs, links and articles were shared inspiration and some of my slightly edited email responses on cycling topics over the years to questions about the the craft of cycling. Adrian was a cycling world traveler, tourist, camper, randonneur ( www.rusa.org ), advocate, website designer and all around great guy that made people smile and remember him everywhere he went. I am proud to say he was my best friend but he was best friends to almost anyone that met him. Now that I know how to post to this thing (thanks to Adrian's son Ian ) I hope to continue Adrian's work to promote cycling to some degree and share forty plus years of cycling calamities and observations with who ever cares. To put things in perspective the last blog post Adrian arranged about turn of the 19th century English bicycle touring from Horace Kephart was performed using his knee tapping against a Morse Code "knee switch" on a power chair as ALS had stolen most of his other mobility, He was one great man. If you are a cyclist you owe it to yourself to go to some of Adrian's links and learn something about it. His "http://cycling.ahands.org/" link posted below is one of the most informative cycling websites on the internet. Feel free to post your kind comments. February 3rd marks the one-year anniversary of Adrian Hand's death. Buddhist tradition calls for a day of celebration of his life. His wife Padmini has organized an event at the SGI-USA Buddhist Center in Raleigh on Sunday February 5 which will be preceded by your choice of two bike rides. 9:00 AM – 30 mile ride led by Gilbert Anderson of Adrian's Haunts. Jerry Phelps will be riding the permanent populaire and all RUSA members are welcome to come along. Please send me your Name, Address, and RUSA number. I will have a waiver at the start. For non-RUSA members, Gilbert Anderson is also organizing a 30 mile ride along Raleigh greenways at a casual pace. Start and finish 6307 Chapel Hill Road, Raleigh at 9:00 AM at the SGI-USA center. Please be ready to leave at 9:00 AM. Contact him at North Road Bicycle Imports or milesawhelen@mac.com if you want to ride with him. Please join us for fun and companionship and remembrance. "The less a man carries in his pack, the more he must carry in his head." Kephart was the real deal --living, and writing, in the wildest part of the Great Smoky Mountains of western North Carolina, before it was a park. He helped establish the park, and the Appalachian Trail. You can still buy his book, because while gear and materials have changed quite a bit, mountains, rivers, flora & fauna have not changed much. Don't miss the cycling page with the Balloon Silk Tent, Japanese Rubber air bed, Down Quilt, etc. These have inspired the current ultralight hiking (and often biking ultralight in a funny, to me, way) guru Ray Jardin of the book "Ray Way." Sadly, Mr. Kephart was killed in a horseless-carriage wreck at age 69. Hooch may, or may not, have been involved. The problem of what to take on a trip resolves itself chiefly into a question of transportation. 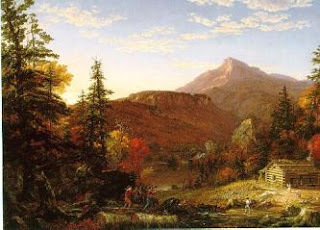 If the party can travel by wagon, and intends to go into fixed camp, then almost anything can be carried along - trunks, chests, big wall tents and poles, cots, mattresses, pots and pans galore, camp stove, kerosene, mackintoshes and rubber boots, plentiful changes of clothing, books, folding bath-tubs - what you will. Such things are right and proper if you do not intend to move often from place to place. But in any case beware of impedimenta that will be forever in the way and seldom or ever used. It is quite another matter to fit out a man or a party for wilderness travel. First, and above all, be plain in the woods. In a far way you are emulating those grim heroes of the past who made the white man's trails across this continent. We seek the woods to escape civilization for a time, and all that suggests it. Let us sometimes broil our venison on a sharpened stick and serve it on a sheet of bark. It tastes better. It gets us closer to Nature, and closer to the good old times when every American was considered "a man for a' that" if he proved it in a manful way. And there is pleasure in achieving creditable results by the simplest means. When you win your own way through the wilds with axe and rifle you win at the same time the imperturbability of a mind at ease with itself in any emergency by flood or field. Then you feel that you have red blood in your veins, and that it is good to be free and out of doors. It is one of the blessings of wilderness life that it shows us how few things we need in order to be perfectly happy. "We do not go to the woods to rough it; we go to smooth it - we get it rough enough in town. But let us live the simple, natural life in the woods, and leave all frills behind." An old campaigner is known by the simplicity and fitness of his equipment. He carries few "fixings," but every article has been well tested and it is the best that his purse can afford. He has learned by hard experience how steep are the mountain trails and how tangled the undergrowth and downwood in the primitive forest. He has learned, too, how to fashion on the spot many substitutes for "boughten" things that we consider necessary at home. The art of going "light but right" is hard to learn. I never knew a camper who did not burden himself, at first, with a lot of kickshaws that he did not need in the woods; nor one who, if he learned anthing, did not soon begin to weed them out; not even a veteran who ever quite attained his own ideal of lightness and serviceability." "To equip a pedestrian with shelter, bedding, utensils, food, and other necessities, in a pack so light and small that he can carry it without overstrain, is really a fine art." Your thoroughbred camper likes not the attentions of a landlord, nor will he suffer himself to be rooted to the soil by cares of ownership or lease. It is not possession of the land, but of the landscape, that enjoys; and as for that, all the wild parts of the earth are his, by a title that carries with it no obligation but that he shall not desecrate nor lay them waste. "I love the unimproved works of God." FAQ: What's your experience with Moultons? Moulton bicycles certainly must be the most misunderstood bicycle product ever invented. I have harbored a curiosity about these odd machines since introduced to them by my bicycle club president, a notable local racer, in 1974 or so. I thought, should I ever get a chance, I'll have to have one of those Moultons. The model at the time was the state of the art F-frame Moulton Mark 3, which, while very different, looks today a bit like many (not all) Bike Fridays in layout. Years ago, a fellow brought a spaceframe Moulton (modern era model) into our shop for resale. I ended up buying it and I was hooked. I have owned just about every type of nice racing bike, and touring bike (Tandems—3, ATBs—5) over a decade before I owned my first car—which cost about the same as my first Moulton. The Moulton was remarkable; it had it's limitations, not for everybody, but certainly what I was looking for. I decided to convince a reluctant Moulton factory to set me up as a dealer. They just did not need the American market, I was told. Now, twelve years on selling them, we have found it is lots of fun dealing with Moultons on a daily basis, but I have much better business opportunities than selling bikes that can have over a year wait from purchase to delivery. These days, we can often ship from stock, but if not on-hand or in the line-up to be produced, the wait can be challenging. The Moulton GT is in the connoisseur class. However, we generally find the lower price models better for touring, and they are very nice indeed these days. Having said this, if you feel as did Churchill when he quipped "I am easily satisfied with the very best", we do have very large bags to fit the GT. There are lots of different types of touring, and lots of different Moultons for these requirements. For loaded Touring, we sell many large bags and Moulton's can take huge panniers if needed, but it depends on the model and carriers. Remember, panniers were originally designed for donkeys, not bicycles. Large wheel bikes work okay with panniers, if you get over the heel bumping them, and dragging the ground with the large ones. With small wheels, a single bag (as opposed to opposing panniers), is more appropriate. The Moulton is a system for touring; for different types of touring, on-road, off-road, randonnees, mountains, flats, lightly loaded, heavily loaded, bad weather, traveling, stowing away. There are special frames, special models, special modifications, dedicated components, special luggage carriers, special luggage, all optimized to do the job and task at hand. One sort of odd and terrible thing about Moultons: We often see used models selling for more than we sell new ones. High demand, low supply, poor distribution—a real team. It has become known as a cult bike; a term I used to resist, I accept it now. Most Moultons can be adapted for most people's uses and are generally much more versatile than standard big-wheel bikes. On cost, while there are no rock bottom world-beater prices, generally they offer real value and their costs are generally nowhere near a mid-range racing bike these days, and Moultons offer much, much more. Now, if you want to shoot the moon: sell your spare Patrick Phillipe and pick out something nice in gleaming stainless steel and hunker down and wait (sometimes). Your bikie friends will be either jealous or write you off as an eccentric crazy. You don't care what they think anyway; you are on a Moulton after all. Courtesy of Jim Foreman, who is pushing the envelope on this subject. The C&O Towpath--its Not just for Mules anymore! We periodically take small groups bike-camping on the C&O. Back in 2002, we made a 3½ day ride along what was the entire length back then, overnighting at the luxurious Red Rooster hostel in Paw Paw WV, tenting on the grounds of a hostel at Harpers Ferry, and finally tenting trailside on our final night. We rode Amtrak between Raleigh and DC. 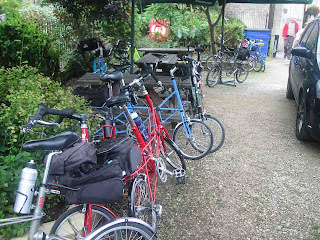 We mostly rode our regular commute/touring/brevet bikes, e.g. 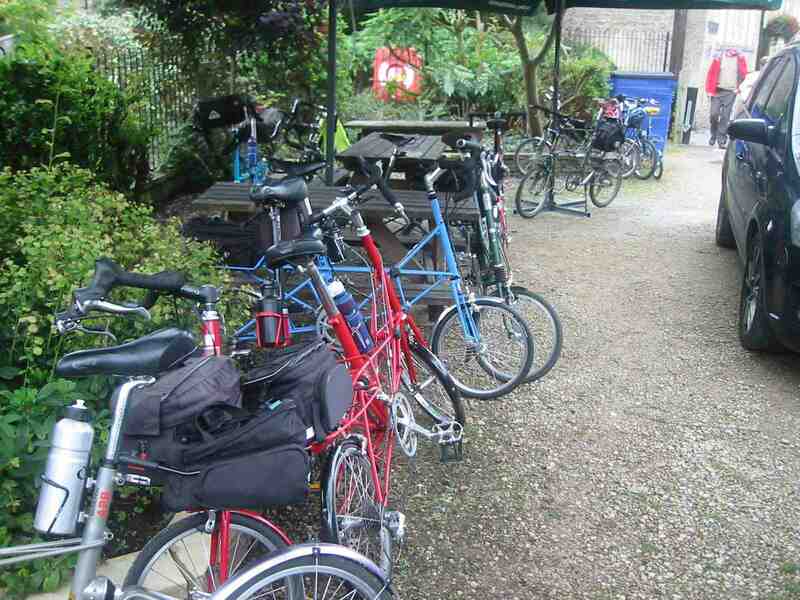 Adrian's Koga-Miyata, Gilbert's Moulton, Sue's retro Raleigh Superbe, Mark's Trek (with oyster bucket panniers), Cheseley's Moulton etc.. Pieter rode his sturdy Dutch Gazelle cruiser. Henry and Roger arrived at camp ahead of us and biked into town in search of food. large beaver darting across the trail at night in the rain. Shirley says that J.D. is the only man in town with a city ordinance written specifically against him -- when he was a teenager he used to fly down the mountain and through town on his bicycle and raise the ire of the local "Barney Fife". He had a salvaged Buick steering wheel welded onto the stem of his Sting-Ray and ol' Barney got the town council to pass a regulation against equipping bicycles with automotive steering wheels. Years later, after J.D. 's old filling station was wrecked by a flood, he hit on the idea to reopen as a hostel, much to the benefit of all users of the C&O towpath. no spitting, outside of competitions. always call the pocket before shooting. no peeing on the campfire. no counting your money while you're sitting at the table. no doubling back--we go forward and find a new route. no making eye contact with anyone at the battleburger eatery. Particulary the owner. no rain gear--skin is waterproof. no fighting with the railroad men. no watering down the whiskey. when executing dangerous stunts, no fair peeking. all bets are final on handshake, to be paid in full by sunset. we've been drinking whiskey for breakfast. Few who study Artaud realize that when he advised, "Don't tire yourself more than need be," he was referring to heavy bicycle tires. Don't let the puncture-proof hype trick you into loading down your wheels with overweight tires. Even the heaviest tires get flats. If not in the tread, then the rim or spokes, valve hole or sidewall. On really hot days, I have had some small-wheel ( They dissipate heat poorly ) valves melt out of the tube! Usually, this happened when parked in the sun after miles of riding on hot pavement. What tire stops that? Embarrassing. In my youth, we used to ride delicate sew-up racing tires on gravel covered mountain roads with no unusual amount of flats. Few people know how to efficiently fix flats anymore. In the old glory days of profitable bike shops with large staffs we trained our customers to fix flats and do lots of routine maintenance when they bought a bike; for free. I had to lay those two guys off years ago, and now when we do maintenance classes I'm so busy I hire a paid "repair consultant" that people pay to see in action while I go back to work. Bike clubs used to share repair information but now the clubs are generally small and clic-ey, not clubby like the old days. A bike with lightweight wheels is a true joy to ride. Tires can be both durable and light. My favorite touring bike can use three different tires that, together, are lighter than one of the Schwalbe Marathon Plus tires--not that the Pluses don't have their place in remote areas and long distances on gravel roads or no roads. One thing to think about: Why spend the money on a lightweight bike if you are going to put several pounds of tires on it? 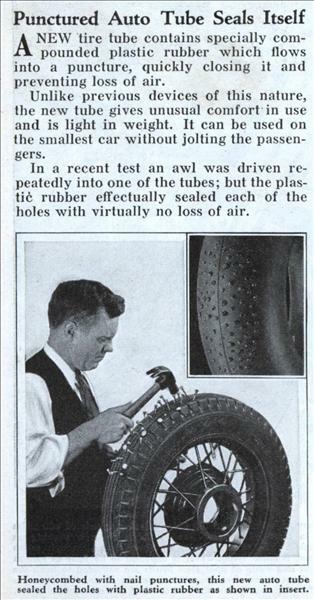 Anyway folks, Get a rim, an old tire ( practice can be hard on tires ), some tire tools and a patch kit, then practice until you have no skin on your hands, wash up, repeat and develop confidence. When you ride with me, I fix your flats because I hate standing in the cold, or hot, or rain or snow while I watch people struggle. You only get one lesson from me, so observe well. Next time on the road, I wait up the road in a climate-controlled building for you to arrive with your new found self-sufficiency. One tool tip: Some tire & rim combos are really tight; especially when the tire is new. A "Var Tire Tool" wishbone install jack is a small, easy-to-carry tire installer that allows you to get the tire bead on that last inch. If you can't find them easily, I sell and ship them all over the USA. GB success will continue - Clancy - Ed Clancy believes GB cyclists will deliver Olympic success even if performance director Dave Brailsford leaves his role.